A few days ago I posted this about going to see manatees in Fort Myers on our Facebook Page. Our followers loved the video and a few people messaged us privately asking for tips on where and when to best see these beautiful creatures. I thought it would be best to turn all those responses into a blog post. If you love Florida wildlife like we do, then you are in for a treat. Temps are dropping and this means the manatees are mingling! Brrrr... as I'm writing this it is 47 degrees outside. Now this may not be chilly where you come from but for Floridians far and wide it means frostbitten toes in our flip flops. Along with this peculiar "cold weather" ailment comes the best opportunity to see manatees in the wild in Fort Myers. "So do manatees only come out when it's cold", you ask? Well, manatees don't exactly love the cold weather. Actually, they hate it just as much as us Floridians do! Rather, they congregate in one particular area when water temps drop significantly, as they have in the last few days. So why on earth would manatees enjoy swimming particularly in the Orange River? You should always go during the coldest time of the year and day to increase your chances of seeing manatees! You see, Florida Power and Light is located just on the other side of the street. This is where the electricity is generated inside the Lee County Power Plant facility, which is powering my computer right now as I'm typing this! Cold water is used to cool down machinery throughout that power generation process (but don't ask me how or why... I'm here to tell you about manatees not lecture on heat transfer physics).This warmed up water then flows out into the Orange River, where it attracts manatees from all over our local waterways. Manatees are also lovingly called "Sea Cows." If you've never seen these creatures before, imagine a seal that doesn't spend any time on land and has a bigger flipper. Now imagine said sea cows enjoying the warm water coming from the power plant in the midst of winter that they are used to all year round! I assure you they are still happy to take a warm bath - even sans bubbles, a book, and candles. The colder the general water temperature, the more likely manatees will be hanging out at the power plant facility. This park gets really, really busy on the weekends. I would highly suggest you go early if you are planning a weekend trip. Manatee Park is located at 10901 Palm Beach Blvd. Fort Myers, FL 33905. No matter which direction you are coming from, it is likely best to take I-75 and get off at Exit 141 - Palm Beach Blvd. You have several options at Manatee Park. You can watch from the lookout posts, or rent kayaks and canoes to get in the water and see the manatees up close. You may also visit the gift shop, which is open 7 days a week from 9AM - 5PM through March 31st. Call the Manatee Park Gift Shop at (239) 481-4600 for pricing info on kayak and canoe rentals. This might sound silly, but don't forget your sunglasses. Bring polarized sunglasses if you own a paid. This will allow you to see "through" the water, as the manatees tend to hang out just underneath the surface. The glare can be quite strong depending on the time of the day, and we would hate for you to drive all the way out there only to see your own reflection and no manatees. 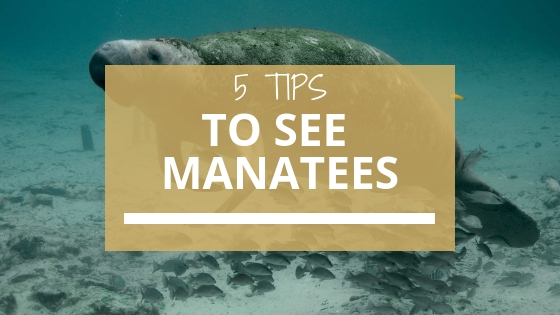 Don't forget your camera - you WILL see tons of manatees if you follow all of our tips! Download the PDF with ONLY the nitty gritty details of where, when, and how to see manatees in Fort Myers below.